hey dave, do you know what the decals for the truck looks like? just wondering. The "buzz" about this new kit reminds me of "back in the day" when a newcomer to model kits named "The Ertl Company" announced they were designing a "Blueprint replica" of an International Transtar CO/4070. That kit set the bar for kits for years to come. By the looks of the Moebius LoneStar, the bar has just been moved up several notches. I just saw a funky Lonestar today dressed in scarlet red with a matched Great Dane Stainless 50 foot reefer set up. I still think the Midland livery is my first project when it hits the shelves. 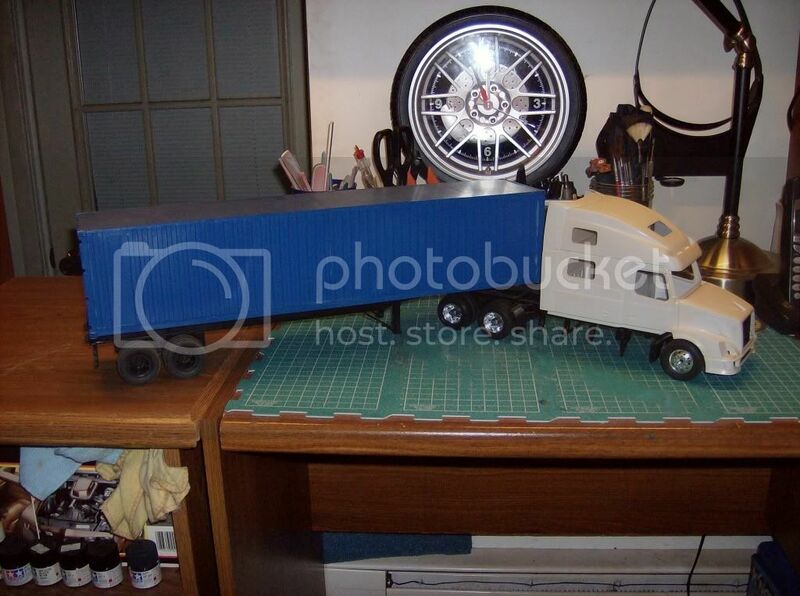 By what I saw in the test shot pics, you should even be able to build that truck exactly as it looks in the pic. I don't know if anyone esle noticed it, but it appears to me the air deflector on the top of the sleeper was taped on, hopefully meaning it is a separate piece. i saw that too, the whole top looks like it mite come off. i seen a lonestar today just for a few secs and it could have ben for SYGMA. the fast food comp that does checkers and sonic here in town. I won't get too excited until I see it on the shelves, but I'm glad to find out it's at this stage! I've seen these trucks in Erb livery, too. Hey Tim, You can bet that someone will do it in a day cab version. I would to thank you for coming in here to hear what we builders are saying. It's great seeing a brand new model ! I know you'll get bombarded by suggestions but here is one for your consideration, if the Prostar or other trucks in IH's line up use the same platform and cab how about making a conversion setup with just the hoods for the different models? They could be used in conjunction with the Lone Star kit. Just an idea for thought. This is something I think would be a big hit. Parts packs which include a hood and necessary parts(radiator, brackets, etc.) for conversion to a different model. Also, separate packs with a daycab panel including glazing, different factory exhaust set ups, other sleeper options, alternate wheels and tires(highway, offroad, etc.). How about a NW style straight truck a-train tanker combo? That would look pretty cool. I used to see TONS of these on the I-5 around Anacortes. Don't know what we'll include for decals yet. Right now our priority is to get this kit from the mock-up stage you see now to tooling! I'd be really happy if I have the mock-up physically in my hands for a final review with the guys at Navistar within the next 30 days! After that I can start working on stuff like a decal sheet and box art etc! We are hopeful that the kit will make store shelves at the end of this year or early next year. I've had the good fortune to spend a good part of a day crawling all over one with a camera. That truck happened to be a prototype that Navistar had given a local man & wife team to drive as a test vehicle.. I guess that they had truckers pounding on their door in truck stops all over the country wanting to know what that truck was and where could they get one like it.. The guys at Navistar finaly came up with literature racks to hang on the mirrors so potential customers could get those answers! My name is Dave Metzner and I'm new here, Art has already pretty well explained that I'm the product development guy at Moebius Models. I'll try to stop by here from time to time as my schedule allows. 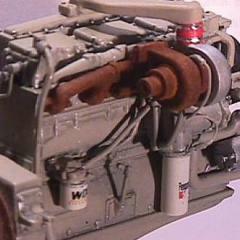 The engine in the kit will be a MaxxForce 15 not the Maxx Force13. This is Navistar's own engine - it is an all new engined, derived from the Caterpillar 15 Litre engine with all new fuel and air management systems and Navistar's EGR polution control system. The suspension will be Navistar's proprietary pieces. Navistar provided CAD files for the Cab, hood, aero package, sleeper, frame, suspension, fuel tanks, battery box and brackets, and exhaust system. I photographed a couple trucks on two different occasions. And we had access to Navistar's computer illustrations of the interior. Plans are to have this kit on store shelves by the end of this year or very early next year..
Navistar refers to the rear suspension on Lonestar as IROS I don't think that is a Hendrickson system,I believe that I've been told that it is a Navistar proprietary design However I am not a heavy truck expert. I know just enough to be dangerous! The prototype tractor that I photographed back in July of '09 had Hendrickson suspension both front and rear (althought the rear did not look like the illustration above - it had large links between the frame rails) it also had a Cummins engine. The one I shot in December had a Navistar maxx force 15 and an IROS rear suspension With Navistars front suspension it was one of the first six trucks built with the new engine. I would not be surprised to find out that you can order Hendrickson suspensions if you want them I'm sure that these trucks can be built to your spec for the most part. My understanding is that engine choices may be more limited than they once were it may be that you can have any engine you want so long as it's a Navistar engine. Navistar is the only manufacturer of big diesel trucks that uses EGR technology to control polution and I don't think that tey provide engines to any other manufacturer. I appreciate the hard work Mr. Metzner. 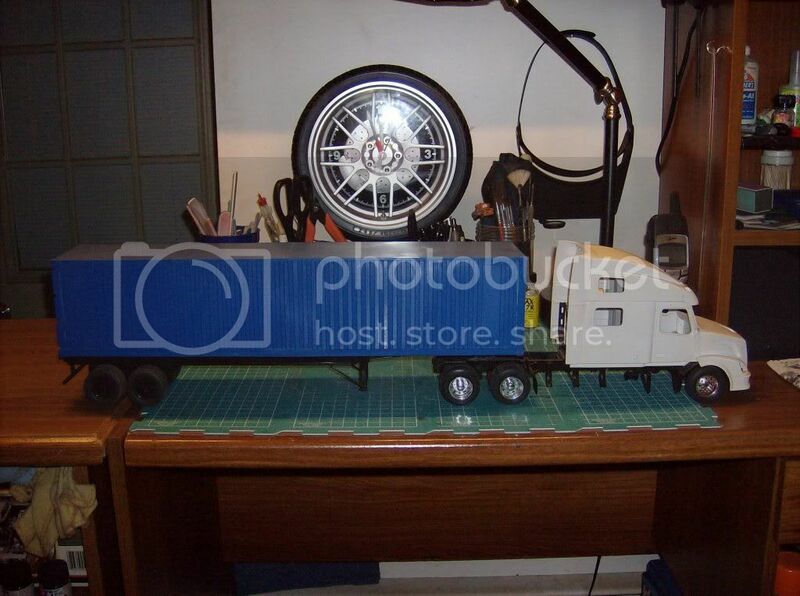 From my experience, several model subjects have made it to the mock up stage only to be lost in the model truck ether. We are still a bit of a ways off from getting this subject on to our work benches. If I might add, please donâ€™t neglect the wheels and tires. Many a good model kit has been compromised by inaccurate wheels and tires. Proprietary International aluminum wheel pattern and low profile highway rubber would be preferred. As far as the Kenworth you mentioned, I assume you are referring to the AMT T600 kit that was offered in the early 1990s. In my humble opinion it was a bust. It appeared that it was a final gasp at AMT trying to resurrect their once proud line of big rig kits. It seemed they were aiming to the NASCAR crowd as a racing team haul rather than the big truck fan. They gave it just enough detail to satisfy the NASCAR crowd and not enough to interest the big rig fan. After your company has sold the first 20,000 kits of the Lonestar and the second 10,000 kits of the Prostar, please considered a Kenworth T700 or a Freightliner Cascadia as your next subjects! Actually, Dave, Italeri made a 2000something Volvo VN Series. The kit overall is not bad, but the way it is in the pictures is what you get, take in mind this one's not finished, but there is no engine at all. The interior and cab is nice as all Italeri kits, but I'm real happy I won this in a show kit raffle, no engine is a real drawback! let us know how the mock-up with international goes dave, and lets get this bad boy to production. now thats one long and bad looking wrecker there.